It already proved that video is the most powerful tool to reach the target audience. YouTube is one of the popular platforms for video and this platform cannot be ignored. Video consumption is the highest whether on computers or the mobile devices. YouTube is thus considered the best option to boost business. 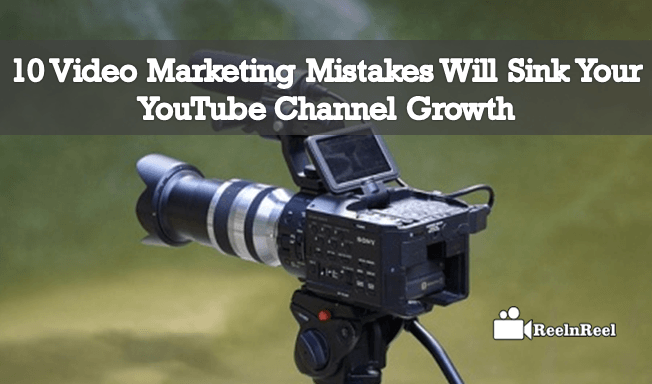 Some video marketing mistakes should be avoided to prevent the effect on the growth of the YouTube channel.Here are the most commonly arriving Video Marketing Mistakes that vanishes the brand name of the channel. Do not use the thumbnails chosen by YouTube. Since the thumbnails are the like covers of book for the videos, customise the thumbnails to attract more viewers but do not use the random snapshots of the video taken by YouTube. Since YouTube videos are for entertainment purpose for many, do not use videos just to sell your products but to incorporate brand essence into powerful message and let it reach the audience. If right keywords are not selected, it will affect the SEO which is an important part of video marketing strategy. Do not neglect to promote the channel as the goal of the channel will not be reached if there is no one to watch. Not using social media page for promoting the YouTube channel is another mistake that should avoided. Though an ancient strategy, email marketing is one of the powerful tools so do not make the mistake of not sharing videos with your clients via email marketing. If you want more likes and leads for your official site with the channel, then you should give way to your viewers to reach the site. Do not forget to add a link to your site. Adding the right call to action directs the audience to take corrective action. Do not create videos without a right call to action. Do not avoid optimising the title, description of the videos on your YouTube channel. Do not make the mistake of uploading poor quality videos. The purpose of any YouTube channel is to achieve the marketing goals. Do not make any mistakes with video marketing and use video analytics to check what is working right for the channel and what is not.